From time to time, the group is set a challenge and the photographer is required to produce a set of photographs that demonstrates their perception of the task. For example, members of the group were put in pairs randomly assigned. The challenge was to take a portrait of the other member and bring them back to the group. This is Marie's portrait of Angelika. 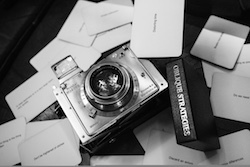 Oblique Strategies - photos taken in response to a randomly drawn oblique strategy card from a deck of cards designed by Brian Eno. The explanation is here and results here. TAG - this ended up being an exhibition but was also a game and challenge. Each photographer takes an image in response to a ohoto taken by the previous photographer - like a game of tag. Suburbia - people were given letters of the alphabet to shoot images based on the theme of suburbia - the resulting A-Z is here. Portrait Challenge 1 - names were drawn at random and members were then asked to shoot a portrait of the member they drew. Trafalgar Square Challenge 08. Ealing extended an invitation to the Queens Park, Enfield, Greenwich, Shoreditch groups to join them for their first photo challenge of 2008. The challenge was to transpose a poem by William Henry Davies and produce a panel of 3 photographs depecting their individual perception of it. Bermondsey Challenge 07. The group had to contemplate a Louis Sullivan quote and produce a panel of 3, 5 or 7 architectural photographs, each one having a link with the other. Garcin Challenge 09. A few of us were inspired by an exhibition by Gilbert Garcin. He took up photography aged 65 when he retired! His approach is to take self portraits, cut them out literally and create scenes that are often comical or absurd with him in them in which he explores the human condition. The challenge was to create a Garcin-esque photo. We created a group on flickr that anyone else can add their attempt to. If you are interested download this pdf take up the challenge.